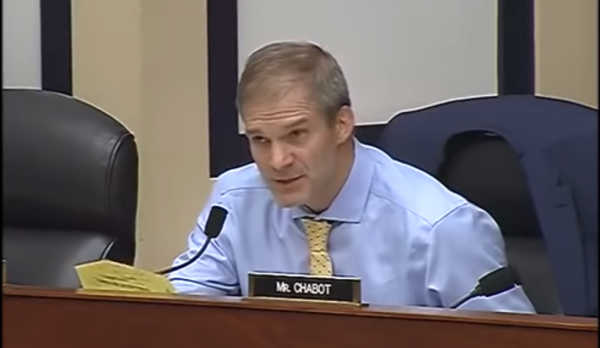 Outspoken Ohio Republican Congressman Jim Jordan ripped Democrats on Tuesday during a House Oversight Committee hearing, contending that the majority Democrats have no “legislative initiatives” other than to attack President Donald Trump, the Tennessee Star reported. It’s evidently a view that is shared by a number of American voters. The president’s popularity seems strong with the Rasmussen Reports daily presidential tracking poll showing 51 percent of likely voters approve of the job Trump is doing. Forty-seven percent disapprove, and according to Rasmussen, the president’s poll numbers have been above 50 percent for the past four days. On Tuesday, he had a 53 percent job approval rating. He’s tracking a bit better than Barack Obama did at this time in April 2015, when then-President Obama’s numbers were hovering around 47 percent. This came one day before Attorney General William Barr told a Senate Appropriations subcommittee that he believes there was spying on the Trump campaign, according to Fox News, and he will be investigating that. Since before Trump even took office, following his stunning defeat of presumed 2016 victor Hillary Rodham Clinton, it has seemed like Democrats have been waging a campaign of distraction against the administration. With the revelation that the report by investigator Robert Muller on alleged Russian interference apparently clears the president of any “collusion,” some Democrats have been scrambling to shift the public’s attention or simply perpetuate the notion that Trump did something wrong by demanding that the entire Mueller report be revealed. There is also a renewed push to get the president to release his tax returns, perhaps as a distraction to the embarrassment over what the Mueller report didn’t say. Through it all, the Trump administration has slogged along, with some occasional tempests mixed with high points including an improved economy. But the president has also lost ground with some key constituencies, including gun owners, many of whom are disappointed at the ban on bump stocks. Trump will appear at the National Rifle Association’s convention later this month, speaking at the annual Leadership Forum on April 26 in Indianapolis.